Capital of the department of Savoy, France. When the Jews were driven from France by Philippe Auguste in 1182, many of them sought refuge in Chambéry and the surrounding country, especially at Yenne, Seissel, Aiguebelle, and Saint-Genis (Gerson, "Notes sur les Juifs des États de la Savoie," in "Rev. Et. Juives," viii. 235; compare Loeb, "Un Episode de l'Histoire des Juifs de Savoie," in "Rev. Et. Juives," x. 32). They were subject to a tax, which in 1300 amounted to 75,374 francs: in 1328, to 2,400 florins (gold): and, in 1331, to 1,200 florins (Costa de Beauregard, "Notes et Documents sur la Condition des Juifs en Savoie," in "Mémoires de l'Académie Royale de Savoie," 2d series, 11; compare Victor de St.-Genis, "Histoire de Savoie," i. 456). Amadeus V. granted them privileges which were confirmed Nov. 17, 1323, these being chiefly in favor of the Jews Vivant de Vesos, Master Agin, his son-in-law, and Harasson de Biauna ("Rev. Et. Juives," x. 32). In 1348, at the time of the Black Death, the Jews of Chambéry were accused of having poisoned the wells at the incitation of Rabbi Peyret and Aboget, a rich Jew. Many were massacred at Chambéry, Montmélian, Chillon, Chatel, Yenne, etc. (Costa de Beauregard, l.c. ; compare Grätz, "Gesch. der Juden," vii. 362). Another persecution occurred in 1394, at the instigation of Vincent Ferrer (Joseph ha-Kohen, "'Emeḳ ha-Baka," translation by I. Sée, p. 85). In 1417 two converted Jewish physicians, Guillaume Saffon and Master Pierre of Macon, were commissioned to examine the books of the Jews at Chambéry in order to find therein the alleged blasphemies against the Christian religion with which they had been charged ("Mémoires de la Société Savois. d'Histoire et d'Archéologie," xv. 21, cited by Gerson in "Rev. Et. Juives," viii. 239). At the request of the archbishop of Lyons, Marie de Berry, duchess of Bourbon, who governed the city of Trévoux in the absence of her husband, Jean de Bourbon, had the Jewish books examined in 1430. The physician Ayme (Amadeus), a converted Jew of Chambéry, was commissioned to examine works written in Hebrew, and to translate the passages that were to be condemned ("Rev. Et. Juives," x. 34). He also conducted an inquiry against the Jews of Savoy, whose books he ordered to be burned (ib. viii. 239). Solomon ibn Verga ("Shebeṭ Yehudah," No. 11) tells of a general persecution of the Jews in Savoy and Piedmont in 1490. Gerson (l.c. p. 236) thinks, not without reason, that this was the persecution instigated in 1466 by Louis of Nice or Provence, a converted Jewish physician, commissioned by his god-father, Duke Louis, to make an inventory of the books of the Jews of Chambéry, who had been accused of witchcraft and sacrilege. This accusation was later acknowledged to be false (Costa de Beauregard, l.c. p. 106; compare "Rev. Et. Juives," viii. 239). In 1430 the Jews were confined to a special quarter assigned to them by Amadeus VII. The count of Savoy compelled them to wear, like the Jews of France, a wheel, half red and half white, upon the left shoulder ("Rev. Et. Juives," x. 33). They were finally forced to leave Chambéry in consequence of the general banishment of the Jews from Spain in 1492. According to Victor of St.-Genis, however (i. 455), this city had a Jewish community in 1714. 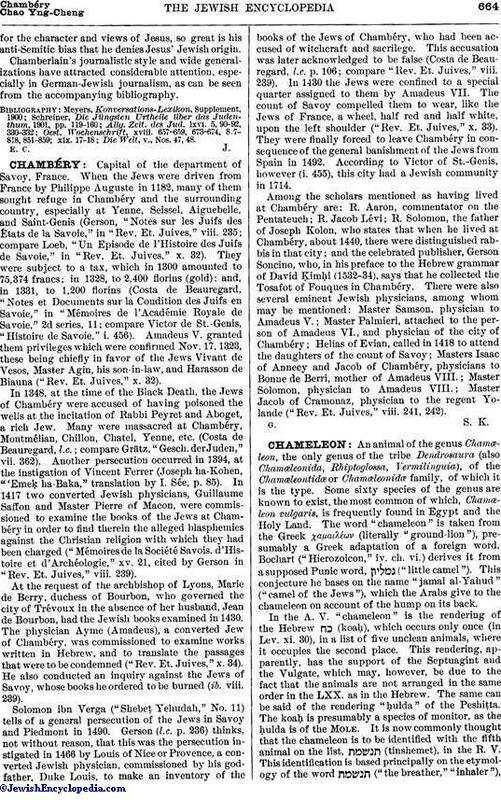 Among the scholars mentioned as having lived at Chambéry are: R. Aaron, commentator on the Pentateuch; R. Jacob Lévi; R. Solomon, the father of Joseph Kolon, who states that when he lived at Chambéry, about 1440, there were distinguished rabbis in that city; and the celebrated publisher, Gerson Soncino, who, in his preface to the Hebrew grammar of David Ḳimḥi (1532-34), says that he collected the Tosafot of Fouques in Chambéry. There were also several eminent Jewish physicians, among whom may be mentioned: Master Samson, physician to Amadeus V.; Master Palmieri, attached to the person of Amadeus VI., and physician of the city of Chambéry; Helias of Evian, called in 1418 to attend the daughters of the count of Savoy; Masters Isaac of Annecy and Jacob of Chambéry, physicians to Bonne de Berri, mother of Amadeus VIII. ; Master Solomon, physician to Amadeus VIII. ; Master Jacob of Cramonaz, physician to the regent Yolande ("Rev. Et. Juives," viii. 241, 242).